Help for a finicky seedling? 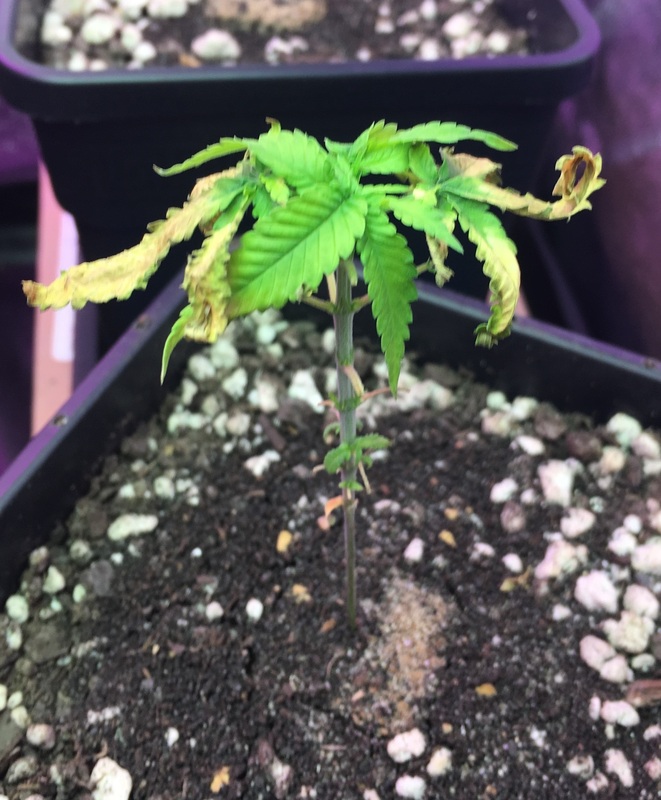 I'm at a loss: here we have a little Apollo 13 seedling, just starting on its third set of leaves, but the first leaves are turning unhealthy in a hurry. 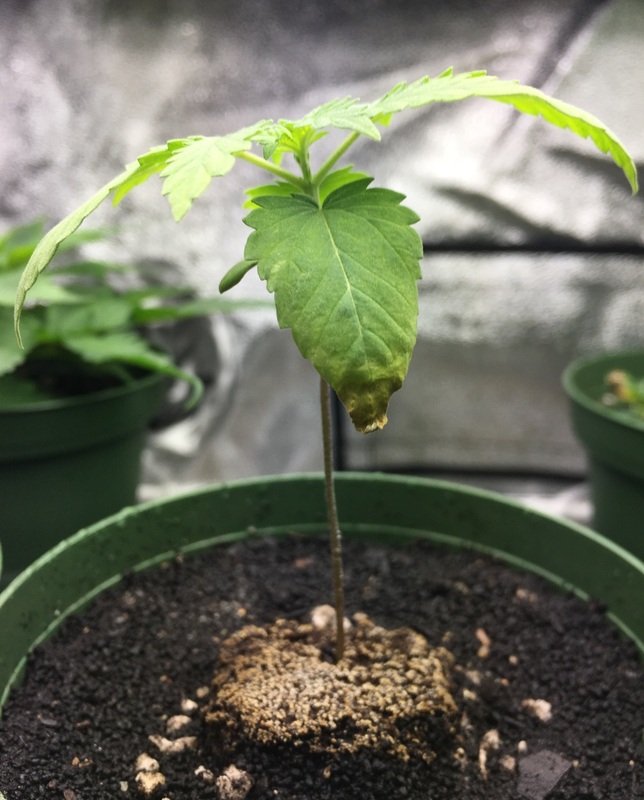 This happened over the past 48 hours, but it's also the third A13 seedling I've watched this happen with (and it looks like the fourth seedling is about to do the same). I've been trying to go light on the watering with the seedling pair I have going now, as I thought that the problems I had with the first two seedlings (who are barely clinging on to life) might have been overwatering/root issues. 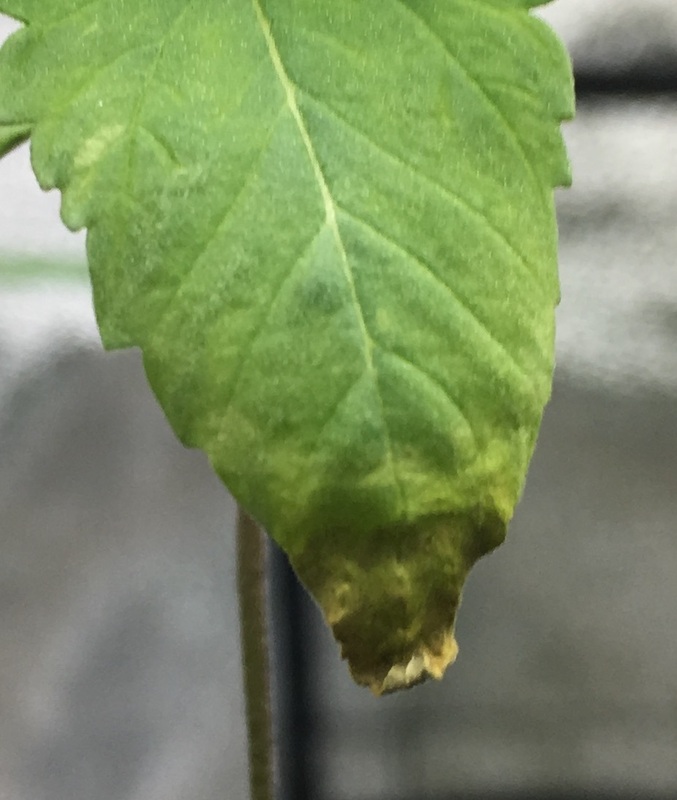 With the first two seedlings, this crispy death would slowly consume the oldest leaves, and just steadily climb up the plant. The oldest-to-newest progression makes me think this is more nutrient-related than root related, but on a plant so young?! Are there plants that are such nutrient hogs that you need to start feeding heavily by the 2nd/3rd set of leaves? Can we have some details on what kind of soil you are using? Are you ph testing your water? Has this issue happened with other seed varieties in your garden? Im with jake. Its a soil problem. I seen the soil and thats the first thing you need to fix. Doesnt look like much aeration in there at all. Doesnt look like much aeration in there at all. The pic is misleading -- I put a very thin layer of EWC (like 2mm) on them this morning, and beneath that is a mix of 60% Happy Frog/40% perlite. Soil info above -- using Happy Frog with a lot of extra perlite. Just probed the soil in the two seedlings, and both read around 6.7. I've been using RO/DI water with a few drops of General Organics CaMg+ to add some TDS back in (as recommended by "The Rev") -- pH reads at just shy of 7.0 using both pH pen and test strips. I've had trouble with any seedlings I started in "Light Warrior" soil by Fox Farm -- two such seedlings recovered quickly when I moved them into Happy Frog soil, the other two (my first two A13) did not recover when moved to different soil. 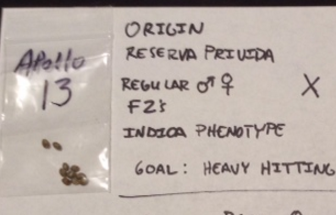 I have had very good success germinating seeds in RapidRooters and then dropping that into a 2" of Happy Frog -- admittedly, I've only done this 10-or-so times, but all but the A13 had happy childhoods. Are the A13 pots all from the same bag of soil? Is it possible you got an extra hot mix? Yeah thats weird. Maybe the mix was super hot or maybe it was missing some heat. I use Happy Frog on all clones and i use upside down Rapid Rooters for seeds and transplant into straight Happy Frog. I never have problems. What is your ppm of the water you are using after you add enough to bring it to 6.9. All three plants pictured have soil from the very same bag of Happy Frog: for the 2-month old A13, I removed as much of its original soil and repotted on June 23, the new A13 seedling was planted on June 22 and popped on June 25, and the CK cutting was taken on June 15. Of note, for the older A13s -- their root system was terrible when I repotted. I had transplanted them into larger pots of "known good" soil when the creeping death started, and when I pulled them out 3 weeks later to replace the soil entirely, the root system on one plant had barely moved into the new soil, and the other plant didn't appear to have grown new roots at all! I think that overwatering would be associated with wilting also... this looks more like nute burn / pH issue (for nuteburn I'd expect deeper green leaves). Very strange that other plants do well in same mix.. I'd try to fix pH down a bit.. and start checking EC. What is your ppm of the water you are using after you add enough to bring it to 6.9.
youre not alone in this one.. 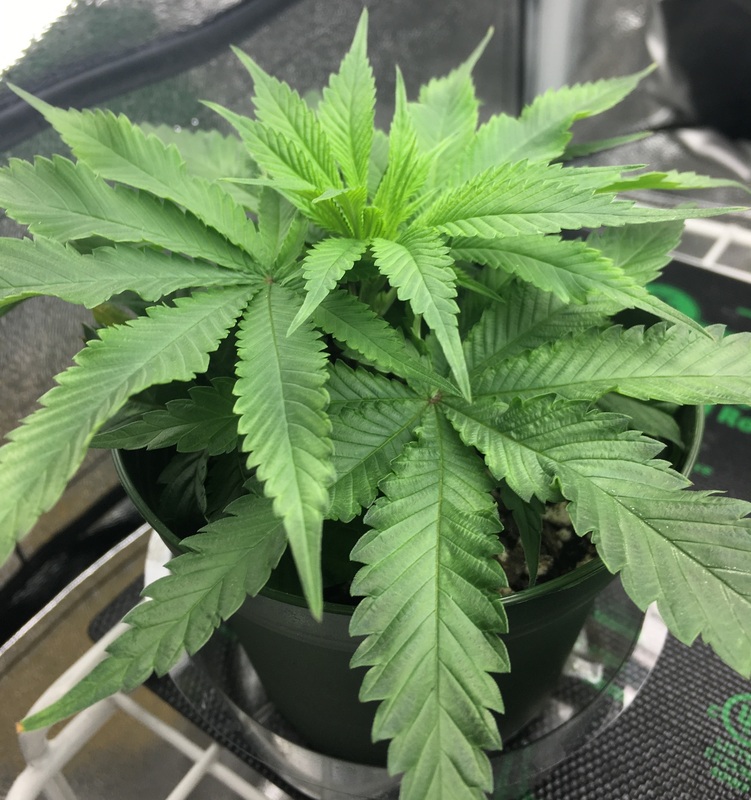 I grew apollo 13 got all males but they seemed sensitive to nutrients, the only fix that managed to work was a Aerated Compost Tea, and moved them under flo's until they hardened off. My hose water is about 7.8 + on average. And my soil is pretty hot at around 8.4-5. 6.2 is the lucky number for my PH of the water. I thought about adding some dolomite lime while cooking my soil mix, then changed my mind and opted for hot. This little ladie outside was planted by seed (April 29). So I'm liking the hot soil with low ph. If you look closely you can see some significant leaves with crazy deformations, from a blockage caused by the h2O ph, at least that is what I thought? Seems to be working fine. Could be strain specific? It was an old random bag seed. Has been smelling really good and looks like she flipped two days ago. Sorry I haven't got any better advice, just how I had to compensate with water and soil. [...] the only fix that managed to work was a Aerated Compost Tea, and moved them under flo's until they hardened off. That's where my line of thinking was going with throwing a little EWC on the top: mild nutrients and introducing some microbes. I'll start some tea brewing tomorrow and give that a shot. Thanks for the info. Looking at the problem it appears to me from looking only the soil may be too rich (highly fertilised) for the seedling. See above It's just a light dressing of EWC on the top because I've been too scared to give them other nutrients in their current state. I'd think that I'd have more trouble with clones in this mix if it were a hot batch (or am I misremembering that clones do worse than seeds in nutrient-rich soil?). Are you sure you don't have that backwards Herbie?